Since 1990 London Bobby has played on cruise ships all over the world. (see QE2), rarer appearances on land are mostly at conventions and at private parties on beautiful grand pianos in some of the most stately homes in Canada and the U.S.
No ordinary singer-pianist, in addition to the usual piano bar repertoire he has another side which has earned him a gold record and plum bookings such as the Golden Lion Pub on the QE2 and the British Pavilion at Expo '86 where he entertained Prince Charles, Princess Diana and a huge daily crowd of visitors, including celebrities, dignitaries and royalty from all around the world. The 20th Anniversary of Expo '86 sees the re-issue of his album " London Bobby Live at Expo" in which he takes the mickey out of the visiting Yanks and Aussies, Scots, Welsh and anyone else who comes by, sings their favourites and gingers up the audience to a fever pitch - well, almost...... Actually he moves the audience not to dance but to lift them from the doldrums to enthusiastic participation, singing, back chat and general partying! I wear a custom-made Union Jack tie and red, white and blue socks with my pearly suit. "I like your tie" said H.R.H. "I had it made to match my socks", says I. "Bet it matches your shorts too", quipped the prince. Contrary to his media image, he has a great sense of humour. 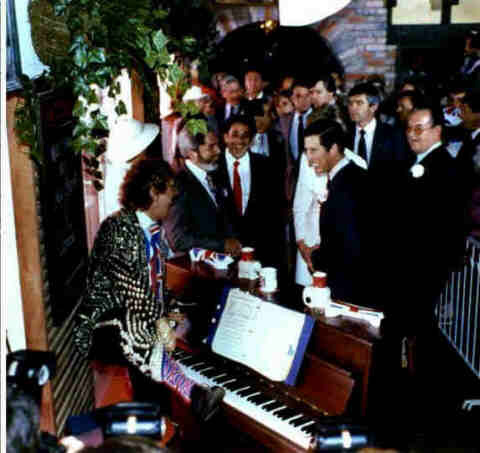 Prince Charles and Princess Diana opened the British Pavilion at Expo'86 and that's where I was lucky enough to meet him across the piano. Princess Diana is standing behind him in this picture (See Diana) She was rather quiet and later on, in another pavilion, she fainted thereby depriving the world of the chance to see this scene which was slated for the front page of the Toronto Sun. This picture appeared in Canadian Living Magazine, used by permission. I was the featured entertainer in the British Pavilion for the full six months of this World's Fair, playing piano and conducting a noisy sing along in the Elephant & Castle, a beautiful reproduction of a London Pub built right into the Pavilion. 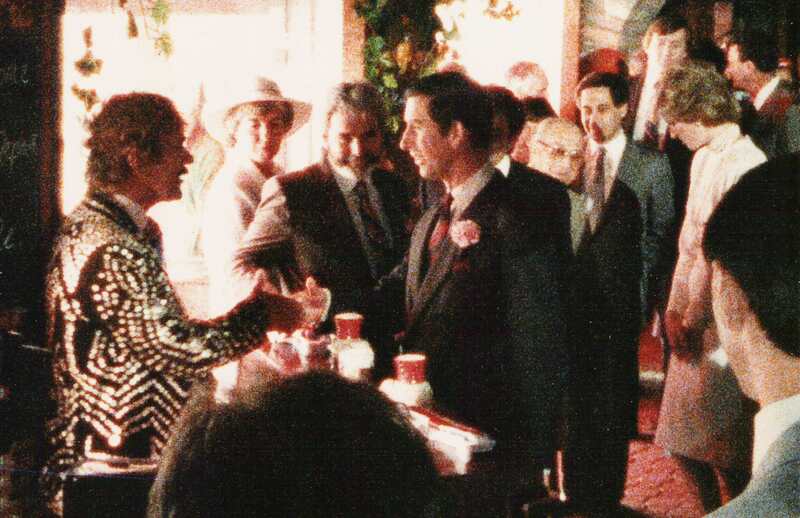 In addition to the Prince and Princess, visitors to the pub included Canada's Finance Minister Michael Wilson, Princess Margaret, Prime Minister Margaret Thatcher and the captain and crew of the Concorde. Finance Minister Wilson came two days in a row and danced the "Knees-up" with Vicky, the Pearly Queen, both times. He was hatching the GST tax at the time, if she'd known that she would have stepped on his toes. The Elephant & Castle chain of pub/restaurants is run by twin brothers from London, Jeffrey and Peter Barnett. They built this beautiful pub and hired me to perform in it. Thanks, fellers. Vicky and I were sad to see this pub go when, at the end of Expo'86, all the buildings were torn down. A link to Prince Charles web site is on my exit page. I doubt HRH has provided a link back to mine so please use your 'back' button. In answer to some comments, this picture is unretouched, unedited. No ordinary singer-pianist, in addition to the usual piano bar repertoire he has another side which has earned him a gold record and plum bookings such as the Golden Lion Pub on the QE2 and the British Pavilion at Expo '86 in Vancouver where he entertained Prince Charles, Princess Diana and other celebrities. He rarely uses tracks and prefers a real piano rather than a keyboard. The 20th Anniversary of Expo '86 sees the re-issue of his album " London Bobby Live at Expo" in which he takes the mickey out of the visiting Yanks and Aussies, Scots, Welsh and anyone else who comes by, sings their favourites and gingers up the audience to a fever pitch - well, almost...... Actually he moves the audience not to dance but to lift them from the doldrums to enthusiastic participation, singing, back chat and general partying!